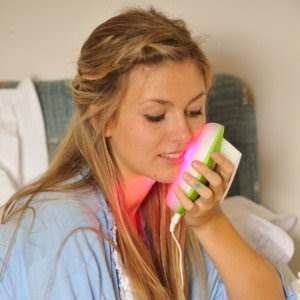 Of the many treatments for severe acne, light therapy is still relatively new in the field. Because the process is still recent, its long-term effectiveness has yet to be proven. Compared to laser treatments, however, research seems to suggest that many acne victims who had undergone the treatment have not experienced the reappearance of this skin problem. There are several treatment systems now available for treating acne. The blue light therapy seems to be the most effective of the group and has lesser intense side effects. It kills the main culprit that causes acne, which is the P.acnes bacterium. The others use some combinations of light and chemicals, light and heat, and a laser treatment. The blue light process has side effects that include swelling in the affected area, skin pigmentation and dry skin. The other treatments using lights have the same side effects although some can cause skin darkening and inflammation of the hair follicles. Acne is the inflammation of the skin caused by the body's reaction to the presence of bacteria that feed on oil and dirt that are trapped in the skin pores. As per the American Academy of Dermatology, therapy kills the bacteria. When the infection is gone, the pores dry out. However, how the process works exactly is still being investigated by science. The good news is that this process does not expose the skin to ultraviolet rays (UV). Moreover, the side effects are mild compared to laser or chemical treatments. What is more encouraging is that this type of medication is convenient because it can be done at home and are generally affordable to many. According to the American Academy of Dermatology (AAD), the side effects is milder compared to treatments using lasers or chemicals. There is no indication that the skin is damaged or scarred. Moreover, as per the academy, some studies have suggested that this treatment procedure has shown mild to moderate improvements to the skins of acne sufferers. The main germ-fighting feature of blue is the production of free radicals during treatments. These free radicals kill P.acnes, the acne-causing bacteria strain. To reduce the occurrence of lesions or pustules and papules, the therapy can be accompanied with the use of topical creams. The treatment is usually spread out in eight sessions within a four-week period. Each session consists of having the acne patient exposed to fifteen (15) minutes of blue light while seated comfortably. This practically painless procedure is usually done by a dermatologist (or a health professional), and the patient can return to work or to his normal routine afterwards. The therapy does not cause sunburn or skin cancer. There are now companies that sell blue light devices for home use. Dermatologists, however, advise to consult your doctor first before doing the treatment yourself. There are certain types of acne that are responds well with this treatment. There are, however, some severe types that may need the addition of other treatments with therapy. As usual, this would need a thorough assessment from your dermatologist. Wondering what light therapy is and why you keep hearing great things about it? Wonder no more! There are many light therapy products available for home use today treating everything from skin and sleep disorders to pain and depression. As you will find, light therapy has a vast spectrum of uses. Check out http://whatislighttherapy.com/ for light therapy product reviews and recommendations today.